The football year is very rich. Between the Women's World Cup, Copa America and the African Cup of Nations, football fans no longer know where to turn. Moreover, to better organize and focus on the matches they consider to be the most important, supporters of the teams involved in the CAN 2019 can already download the official calendar of the event in PDF format. As a reminder, the competition is taking place this year in Egypt. Pharaoh Mohamed Salah will be keen to defend his country's colours and win this cup. In 2017, Egypt lost 2-1 in the final against Cameroon. The 2019 CAN will start on 21 June and end on 19 July. Classfoot Worldcup 2006 is a software that allows you to follow the 2006 World Cup. It gives you various rankings and statistics on this competition. The calendar of the French football team includes all the friendly and qualifying matches for the World Cup. 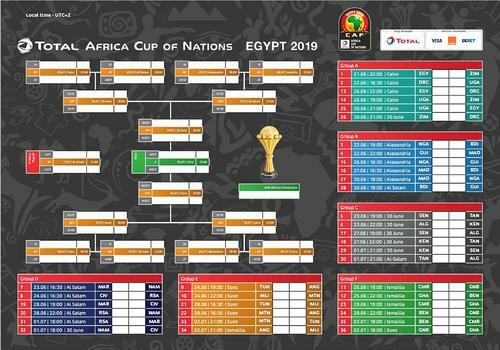 Find the complete calendar (in JPEG format) of the 2017 African Cup of Nations with the dates, times and venues of the 32 matches of the competition.